Aspendus is located in the ancient region of Pamphylia. According to some experts the earliest settlers of the city were the Hittites. The name Aspendus is of Anatolian origin. The Greek colonies arrived here around 13th C BC and took over an existing settlement. Alexander the Great claimed the city from the Persians and during the Roman period it was an important port city. The city was founded on a hilltop and spread down to the plains. 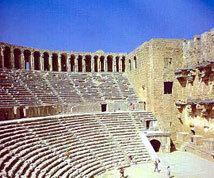 Aspendus has one of the best preserved and largest Roman theaters in Turkey. It was built in the 2nd C AD. The city's aqueducts are also well preserved and worth a visit.